The term cat-dog has taken on a whole new meaning after white English bulldog Molly began nursing a litter of newborn kittens after their mother was killed. 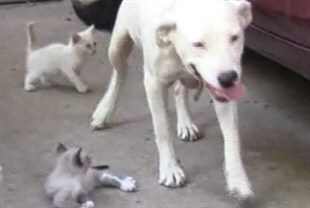 In a tragic accident owner Elbert Bristow, 84, of Columbia, Alabama, ran over the mother of the litter and was surprised to find Molly, who had given birth to three puppies the day before, feeding the four kittens from its own teats. Though it is not uncommon to see different species bonding, most of us relate cats and dogs with a mutual state of natural enemies. This is a sign of maternal instincts at its best.